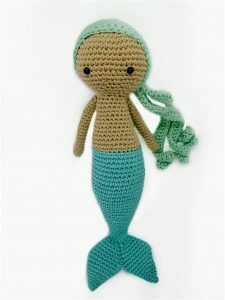 Mermaid measures about 26 cm from head to fin. During typhoon season my son would often get scared, the winds and rain were so strong they would shake the buildings. We have seen uprooted trees and seen destruction from many typhoons. I told a story about how the merpeople who live in the waters of Hong Kong will fight the evil typhoon monster away. Since then, he hasn’t been scared much and has found comfort in the story. Please be sure to tag me on social media (@anniegurumi) and use #anniegurumi so I can see your mermaid. Thank you for enjoying my pattern. FO and leave long tail for sewing. R17: (sc, ch 45, dc into 3rd st from the hook BLO and each ch across)* repeat 3x (3 total strips), sc 21, dc 18, sl st into 1st st. FO leaving long tail. 2. Sew fins together then onto tail, being careful to position it correctly. Use picture as a guide. 3. Flatten arms and sew arms where the head meets the neck. Use pins to ensure it is positioned correctly. 4. use hair as a wig or use same colour to sew onto place. Place so the strips are on the side of her head, above her shoulder. Optional ribbon for tying the hair into a side pony tail. Or you can use the long tail from FO to tie into side pony. 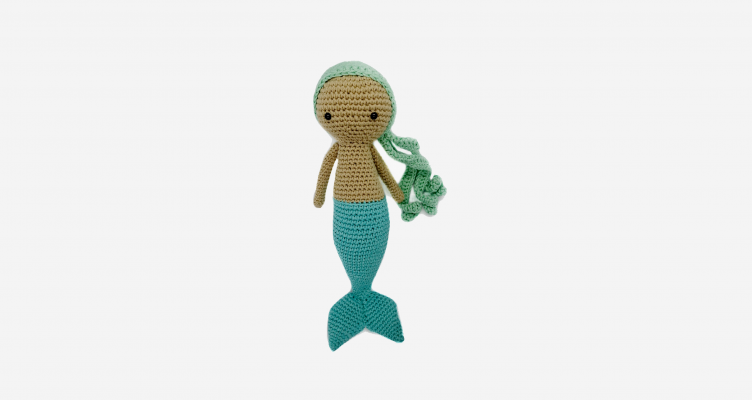 You have your own Mermaid! Thank you for trying out my pattern and a big thank you to Hobium Yarns for the gorgeous yarn.